Beautiful You: Miracle Skincare | Alpha H, The Body Shop & Clarins! 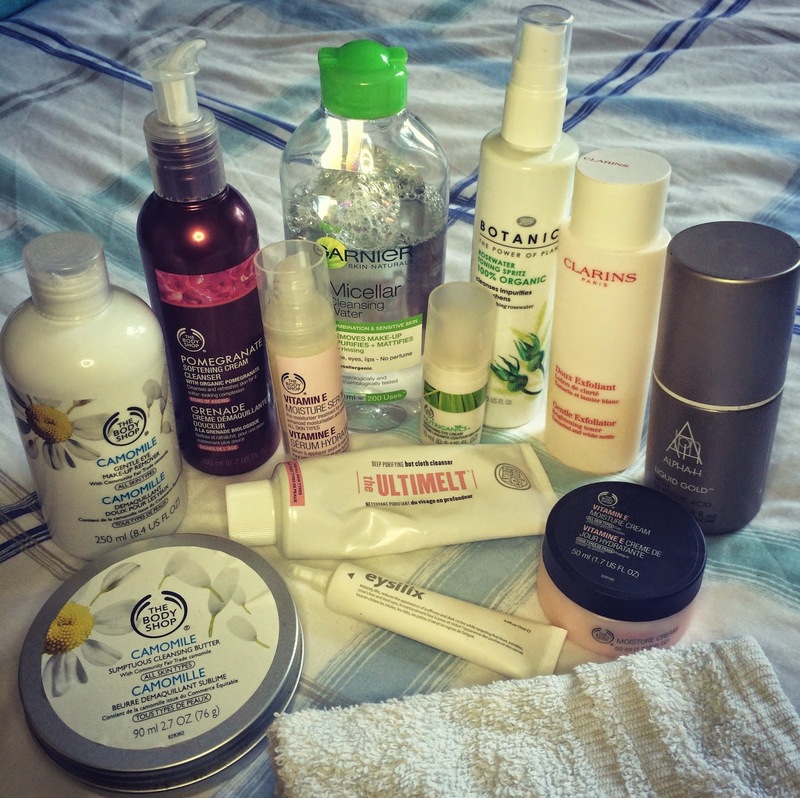 Miracle Skincare | Alpha H, The Body Shop & Clarins! So recently I have been having trouble with my skin and no matter what I tried nothing seemed to work. When I say trouble, my 'trouble' isn't necessarily that bad but I have always been lucky enough not to have to worry about my skin so going from that to what it had been like was quite upsetting for me. I asked my mum what I could do to help improve it and she gave me a list of products that I need to use, when and in what order and now I will never go back. Now I can't give my mum all the credit for developing this routine because she is a huge fan of Caroline Hirons skincare blog so the hints and tips that she gave me most definitely came from Caroline! None the less, as this routine worked for me I thought that I would share it with you all and hopefully some of you can benefit from it too! First off I always take my eye make-up off and to do this I still use my Camomile Gentle Eye Make-Up Remover from The Body Shop. This is gentle on my eyes but at the same time still removes most of my eye make-up and doesn't leave the eye area really red. Next I remove most of my face make-up and to do this I still use micellar water but I have changed the one I used since my last skincare post. I am now using Garnier Micellar Cleansing Water for combination to sensitive skin because I thought that this would be less harsh. It still works the same as the normal one but as it has no perfume and it mattifies the face which is why I feel that this one has more benefits for me. Now is the time to wash your face with a cleanser. There are so many options for you to choose from here and I have tried a few out and finally found some that work for me. Originally I was using Emma Hardie's Cleansing Balm but this turned out to be too overpowering for my skin so the two options I go for at night are either the Camomile Cleansing Butter or Soap & Glory's Ultimelt, both of which are really moisturising and leave your skin feeling really clean but not dry at all. I just work them both into my skin in circular motions and then remove with a hot flannel. Then in the morning this tends to be my first step and I use the same techniques with the Pomegranate Softening Cream Cleanser. I find that the fruitiness wakes me up in the morning and this leaves my skin feel more firm ready for the day ahead. Now is the point where I usually have my shower during my night time routine and I don't do anything in there in terms of skincare. After my shower I will go on to use an exfoliating toner and again I have two options for this, clearly there are more out there but these are just the ones I use at the moment. Firstly, Alpha H Liquid Gold, I only use this a maximum of 3 times a week as it is quite an intense treatment and then secondly is Clarins Gentle Exfoliator Brightening Toner which I use on the days in between as it is a little less harsh. I just take them both on a cotton wool pad and apply generously to my face and neck area, then I leave it to sit for a few minutes. Next I take my Botanics Rose Water Spray and spritz this generously all over my face, this adds back some of the hydration needed and makes the exfoliating toners a little less intense which is good when you are using them on a daily basis. I some times wipe around my eyes just to make sure that none of the product gets in them and then I let this sit until it is basically dry. Next up is eye cream and I again have two options for this depending on how I'm feeling. First off is The Body Shops Nutriganics Smoothing Eye Cream and the second is Indeed Labs Eysilix, which one I use depends on what I am trying to achieve. The latter is better for when I have puffiness and dark circles and the Body Shop one is better in the mornings when I want that firmness but I still need a bit of brightness. All I do is take a small amount of product on my ring fingers and warm it up a little bit, then I dab it on around the eye area. I think this is my favourite step because I love the smell of these products and that step is serum. At the moment I am currently loving The Body Shop's Vitamin E Moisture Serum, it is so easy to apply and it really does leave you skin feeling really smooth and moisturised. I simply take a small pea sized amount and work this into my face and neck, I focus most on the areas of dry skin I have around my nose as thats where I need the most moisture! This is the last step! I know it can seem quite long when it is written out like this but trust me it doesn't take long at all. The last step is moisturiser of course and for this again I use a product from The Body Shop and it's their Vitamin E Moisture Cream and as normal I take a small amount and work that into my face and neck focusing on the places that I need it most. So that is my new skincare routine, I have only been doing this for just over a week and I can already see noticeable differences in my skin. I think at first it seems a bit daunting how much you have to do but once you are into the routine it really doesn't take as long as you think it would! I hope you have enjoyed reading this and if you try this out let me know how it goes in the comments! I shall also leave you the link to Caroline's blog here because it is definitely worth a read. I shall hopefully see you all tomorrow!